Does the Magic Jack Really Work? The Magic Jack seems like a useful and practical device that allows you to make an unlimited number of phone calls over the Internet. But much more remarkable than the product itself is the puzzling yet meticulous effort the producers of the Magic Jack infomercial make to fool viewers into thinking they are watching the live broadcast for some sort of home shopping channel called the “Savings Shopping Network” (or to be more precise the “$avings Shopping Network”just in case anyone was unclear about what they were supposed to be saving). Infomercials often pretend to be talk shows or news broadcasts because viewers grant more credibility to such presumably impartial programs than they do to advertisements. But the marketing geniuses behind Magic Jack are trying to pass off one type of paid programming (an infomercial) as another type of paid programming (a home shopping channel). What possibly could be the gain in that? It is sort of like the #2 man on the FBI’s Most Wanted List disguising himself as the #3 man on the FBI’s Most Wanted List. Maybe the producers hope to fool grandmas into thinking they’re watching QVC or HSN while they wait for the next Cubic Zirconia Cavalcade or for Jeanne Bice to show up with her latest Quacker Factory monstrosities. The Magic Jack infomercial may not outright lie about what it is, but it does lots of big and small things to make you think you are watching a 24-hour TV shopping network in real time. The host for the Magic Jack infomercial is Mel Arthur, a former longtime host on the Home Shopping Network (HSN) and owner of the most recognizable set of hair plugs this side of Joe Biden. At the start of the program, Mel says, “You know the Savings Shopping Network is here to save you money 365 days a year and we have the biggest money saving device we have ever had in the history of the network.” Undoubtedly true because the “history of the network” includes the entire one minute and fourteen seconds since the infomercial started. And is the “Savings Shopping Network” really there “365 days a year?” One could argue that because they will happily take your order 365 days a year the “network” is there every day. So the Magic Jack is a “FREE” service that costs “$19.95 a Year.” Someone needs to spend $19.95 on a dictionary and look up what the word “free” means. To further convince viewers that they are watching a live broadcast, the infomercial displays a “magicJack units sold” counter (which gets as high as 5259). But the most elaborate ploy comes when Mel interrupts himself, “Wait a second folks, one of my producers is out here.” A woman wearing a headset (and looking quite embarrassed) briefly appears on-screen and whispers into his ear. Mel announces, “They are telling me that the telephone lines are absolutely slammed right now.” Even at those chintzy home shopping channels peddling Beanie Babies and Bowie knives the host wears an earpiece to get direction from the producersbut not here at the $avings Shopping Network! Every infomercial hypes its product, but the hype here seems even less subtle than usual. Bob Losure, an anchor at CNN from 1986 to 1997, proclaims, “In my 11 years on national network news I’ve reported on emerging technologies. However, I’ve never seen anything like the Magic Jack.” Yes, the World Wide Web, cellular technology, and animal cloning pale in comparison to an infomercial gizmo that can make cheap phone calls! Another endorser is David Isenberg, identified as a “Distinguished Member of the Technical Staff – Bell Labs” to ensure you don’t confuse him with all those undistinguished members of the technical staff at Bell Labs, such as the janitors and unpaid interns. 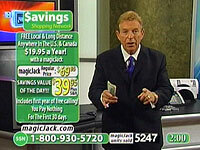 The infomercial also quotes media coverage of the MagicJack, including the Los Angeles Times, which said, “It’s probably the simplest hookup”a designation previously given to Nicole Ritchie. To prove what a simple hookup the Magic Jack is, they drag out an 11-year-old girl named Jillian to provide a demo. Jillian easily slides the MagicJack into the computer’s USB port, attaches a phone line to the Magic Jack, and dials a number. Jillian says, “Hi Grandma,” looks sheepishly at the camera for one second and then hangs up without saying another word. Either that was a fake call or there is one seriously pissed-off grandma at the other end of that phone line! Magic Jack Infomercial or $avings Shopping Network? See how much BS you can spot in the effort to convince people they are watching a live shopping channel. Let's Hang Up on Grandma! In this demo, Jillian calls her grandma with the Magic Jack and then hangs up on her. Granny ain't gonna like that!